Marisol McDonald, for those who may have forgotten, is mismatched and marvelous, unique, different, and one of a kind. 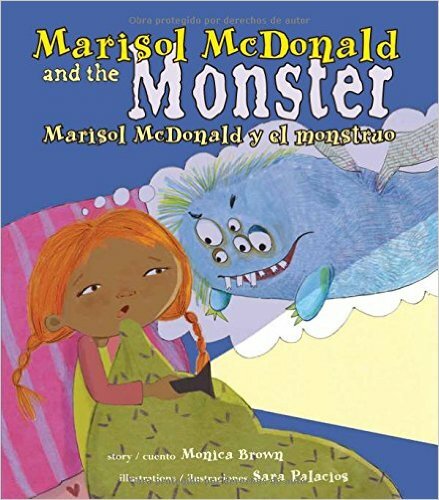 In Marisol McDonald and the Monster, our young Peruvian Scottish American narrator reveals that her favorite letter is “m.” She loves almost all things that begin with “m.” In Spanish and English, her favorite foods are mangoes, melocotones, and milk with miel; and her other favorite “m” words include magic, mustard, moon, monkey, mami, maíz, and magnífico. But the one “m” word that Marisol doesn’t like, at all, ever, in any way, is monster. In fact, she is so afraid of monsters that she keeps her family members up all night until she can fall asleep. The many “monster-under-the-bed” picture books are primarily for children who sleep alone, and the parents are the ones who solve the problem. What’s unique about this story is that Marisol has agency—she figures out the problem and works it through. I would have expected no less of this resourceful little girl. I dress her in a purple polka-dot skirt and a green striped shirt. I sew on three legs so she will be extra good at soccer. And I give her red hair, just like me, and blue fingernails! So, while there’s still a monster under the bed, she’s Marisol’s own monster. Her name is “Melody,” or “Melodía” (of course), and it seems that she’s also scared to be by herself. Palacios’ bright, colorful artwork, rendered in ink, marker, crayon, and cut paper, then digitally enhanced, engagingly balances the well-spaced text, which falls on solid-color or white backgrounds. Her not-so-scary monsters and subtly simple yet detailed illustrations also show what is not explicitly stated. Here, for instance, is Marisol, whose bright red hair matches that of her father and whose complexion is more like her mother’s; while her brothers’ ethnic mixes are shown by their varying complexions and hair colors as well. This teamwork of author, illustrator and translator have created the third in a series of fast-moving stories in a bilingual picture book format, in which a bicultural (at least), independent, resourceful, confident little girl invites hablantes and English-speakers to join her as she navigates her world. As with the first two titles, Marisol McDonald and the Monster / Marisol McDonald y el monstruo is highly recommended.